The percentage of those who support a U.S.–Mexico border wall has reached an all-time high, according to a new poll from ABC News and The Washington Post. 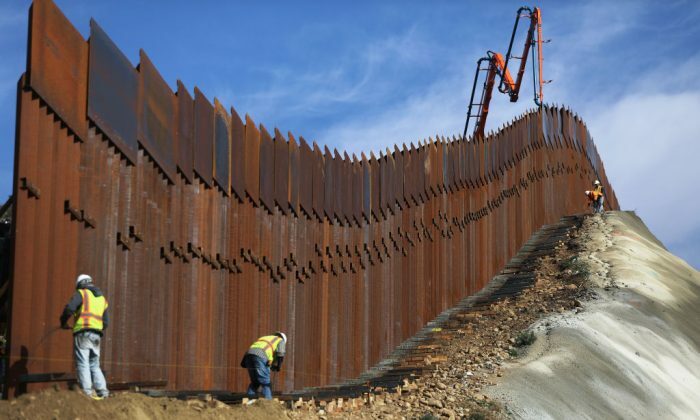 Results of the national survey posted on Jan. 13 found that 42 percent of Americans now support the border wall. The percentage is the highest in the ABC/Post’s polling since President Donald Trump first brought forth the idea as a campaign promise. The number also represents an 8 percent increase from last year’s poll, which recorded 34 percent support. It also broke the survey’s previous high of 37 percent in 2017. The findings come as the partial government shutdown heads into Day 23; it became the longest such shutdown in U.S. history on Jan. 12. Although a majority still oppose the border wall at 54 percent, that opposition has been shrinking. A year ago, opposition stood at 63 percent, while a previous low of 60 percent was recorded two years ago. Trump has requested $5.6 billion in funding for the wall, which the Democrats have staunchly opposed. Democrats haven’t negotiated any new deal since their $1.3 billion offer for border-security purposes, which doesn’t include any funding for a wall. The debate over the border wall has dragged on over the weeks, with Trump describing it as “a crisis of the heart and a crisis of the soul” in his Jan. 8 national address, while House Speaker Rep. Nancy Pelosi (D-Calif.) and Senate Minority Leader Sen. Chuck Schumer (D-N.Y.) have repeatedly called such a proposal expensive and ineffective. It comes after a Jan. 9 Rasmussen Reports poll found that 41 percent of Americans want Congress to do more of what Trump wants. The percentage marks a 12-point increase compared to the same time last year, according to the Rasmussen, one of the most accurate pollsters in predicting the outcome of the 2016 election. At the same time, the number of Americans who want Trump to do more of what Congress wants fell by 8 percent from last year to 48 percent. Twelve percent of the respondents were undecided. Turning to Twitter on Jan. 13, Trump again pushed for the wall and pointed to Democrats to join in the talks. The ABC/Post poll was conducted by landline and cellular telephone on Jan. 8 to 11, in English and Spanish, among a random national sample of 788 adults, with a margin of sampling error of 4.5 points. Meanwhile, a Montana lawmaker says that the state should help pay for the southern border wall. Scott Sales, a state Senator and president of the Senate, said that he’s going to sponsor a bill to appropriate $8 million in state money to help build the wall. Sales said that the $8 million Montana would send to the federal government is an equal fraction of $5 billion, accounting for Montana’s share of the national economy. He added that he calculated Montana’s “share” of the cost of the wall by dividing the state’s gross domestic product by the national GDP and multiplying it by $5 billion. No other states have proposed helping fund the wall through state monies but a GoFundMe fundraiser for the wall, collecting funds from private citizens who want to help build the barrier, raised more than $20 million. That money was slated to be refunded after the fundraiser organizer said his team discovered the federal government couldn’t accept the money in a timely fashion and that he’d formed a nonprofit to use the funds. The South Dakota Senate on Thursday passed a resolution that urges the construction of the barrier in support of Trump. At the same time, a man who came to the United States illegally said he supports President Donald Trump’s proposed border wall. Hilario Yanez arrived in the country illegally when he was a child. He’s one of the so-called Dreamers who is protected by the Deferred Action for Childhood Arrivals, or DACA program. “The president is living up to his moral duties, which is to protect this country. He has every right to ask for border security. Every past president has done this, it’s nothing new,” he said during an appearance on Fox News. In an op-ed for Fox, Yanez wrote that he’s a supporter of Trump. NTD reporter Zachary Stieber contributed to this report. Is Mexico Paying for Trump’s Wall or Not?